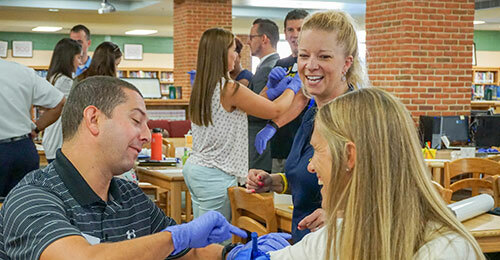 As HCPSS staff prepare for the arrival of students for the 2018-19 school year, 9th grade health teachers received training and resources to deliver effective instruction to students in life threatening bleeding control identification, instruction and skill practice. In partnership with the Howard County Department of Fire and Rescue Services (HCDFRS), the “Stop the Bleed” training aligns with the 9th grade “Safety & Injury Prevention” curriculum requiring every student to demonstrate the ability to respond appropriately to emergency situations. HCPSS teachers apply a tourniquet with the guidance of a HCDFRS instructor during “Stop the Bleed” training. 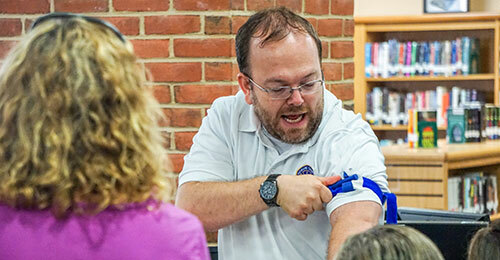 Teachers took a hands-on approach to professional learning by applying tourniquets to one another and packing wounds on an instructional tool that will be provided to each teacher as part of a kit supplied by HCDFRS. This train-the-trainer model consists of HCDFRS personnel training approximately 20 HCPSS high school health teachers who will then educate approximately 4500 students county-wide in life threatening bleeding control identification, instruction and skill practice.. The HCPSS educators and HCDFRS instructors at the conclusion of a professional development session.